Co-Q Daily with Resveratrol provides a full 100 mg of highly absorbable Coenzyme Q10, plus 1000 IU of Vitamin D, 2,000 IU of Vitamin A (beta-carotene) and 30 mg of high potency, Resvida® Resveratrol. With Purity's Co-Q Daily with Resveratrol, which features a highly absorbable CoQ10 blended with Rice Bran Oil, you can be assured that you will be assimilating optimal levels of CoQ10 from your supplement. While many people take CoQ10 in a dry powder capsule, research done on the CoQ10 in liquid capsules found that liquids typically deliver greater absorption than ordinary dry powder capsules. Each serving of Co-Q Daily + Resveratrol contains a full 100 mg of highly absorbable Coenzyme Q10 plus 1000 IU of Vitamin D3, 2,000 IU of Vitamin A (beta-carotene) and 30 mg of high potency, Resvida® Resveratrol. While other supplements offer CoQ10 in a dry powder capsule, research done on the CoQ10 in liquid capsules found that liquids typically deliver greater absorption than ordinary dry powder capsules. Co-Q Daily + Resveratrol liquid capsules features CoQ10 blended with Rice Bran Oil. Purity Products was founded in 1993 by current President and CEO Jahn Levin in Great Neck, NY. What started as a three person operation has blossomed into a thriving, nutritional and health products company, with well over one million customers. Now in our new headquarters in Plainview, New York since 2006, we have made greater commitments to technology and dedicated even more resources to providing our customers with the best possible service. With a broader line of evidence based supplements, highly trained customer care department and more advanced shipping facilities, Purity looks forward to being your only source for science-based nutraceuticals. Our goal is to create very satisfied customers and to exceed your expectations in every facet of the business we conduct. Visit our main website at www.purityproducts.com. I have a long drive to work and then 9 hour days and I'll be 60 in December. I was dragging!! Coffee seemed to do more harm than good and I was desperate to not feel so tired! I heard about this Purity product on the radio and tried it. Wow! I really did notice a difference in my energy level. I now take it twice daily, once as a morning "wake up" and again about 3:30 for a pick-me-up. I hope it is doing good things for my heart and cholesterol as well! But I definitely feel younger and more energetic and I do attribute it to this product! I do get results! Thank you!" I heard about this product on our local radio station and decided to try a free bottle. I have taken it fairly regularly (not each day) and it has made a real difference in both my energy level and mental clarity. I have now set up a bi-monthly purchase. In today's world of hustle, bustle and stress, I know Co-Q makes a difference for me and that is why I am making this recommendation. 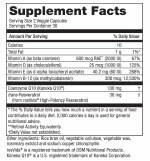 A convenient way to get two of the most popular dietary supplement ingredients together each and every day. Try it RISK FREE for 20 Days. Your satisfaction is Guaranteed!